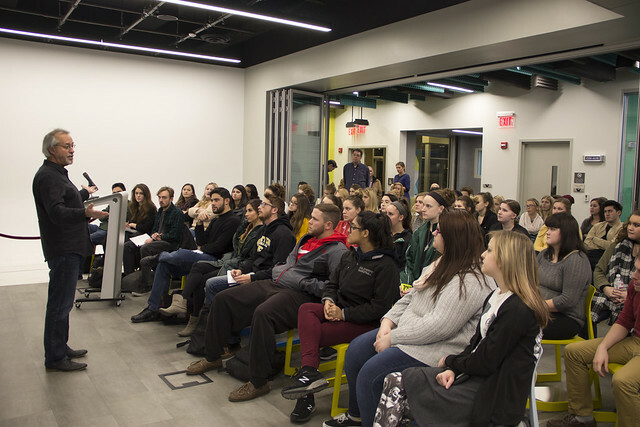 The Center for Media Innovation was packed Nov. 28 with Point Park University students eager to learn how to become like Will Dzombak, manager for Wiz Khalifa, Ty Dolla Sign, The Juliana Theory and MTV Teen Mom 2's Chelsea Houska. Dzombak is also the founder of Taylor Gang Entertainment and the William Gerard Group. The guest lecture event was presented by Point Park's sports, arts and entertainment management program and the University's record label, Pioneer Records. Dzombak was born and raised in Pittsburgh and thrilled to be back giving advice to students about what it takes to have success in the music entertainment business and manage big-named celebrities. "I learned from Will that the team you build around you is very important because you cannot do everything on your own. There are a lot of moving parts in managing an artist, and having good people around you is very beneficial," said Kaitlyn Sayers, a senior SAEM major from DuBois Area High School in DuBois, Pa.
Dzombak's appearance on campus was possible thanks to Mark Fritzges, vice president of promotion for Atlantic Records and part-time SAEM instructor. Fritzges, who teaches Point Park's Recording Business class, met Dzombak at Atlantic Records in New York City right after Wiz Khalifa was signed to the music label. He connected with Dzombak again at a Wiz show in Burgettstown, Pa.
"I mentioned to Will that I taught at Point Park University and would love to have him speak to my class," Fritzges said. "I thought Will's talk on campus was great. His main concern was making sure his message would benefit the students." "After talking nearly an hour, Will spent another 40 minutes answering music business and career-related questions from students," Fritzges added. Mackenzie Caraway, a junior SAEM major from Pittsburgh Creative and Performing Arts High School in Downtown Pittsburgh, said the event related directly to her career goal to become a tour manager. "Being able to attend an event featuring someone who is actively involved in the industry is one of the great benefits of attending Point Park," Caraway explained. "We pride ourselves on being located at the intersection of real and world. This message was one of the reasons I chose to attend Point Park. Having professors who have connections to industry professionals creates unique learning moments and many networking opportunities," she added. "What an incredible opportunity for our students!" remarked Ed Traversari, M.B.A., SAEM associate professor. "Will explained how he worked his way up the ladder to managing Wiz Khalifa. It was very enlightening and inspiring for our students to hear his story." As a student, Sayers said she has been fortunate to complete several internships with the help and support of her professors at Point Park. Sayers added: "The SAEM program really teaches you the importance of making and maintaining connections in order to reach your career goals."